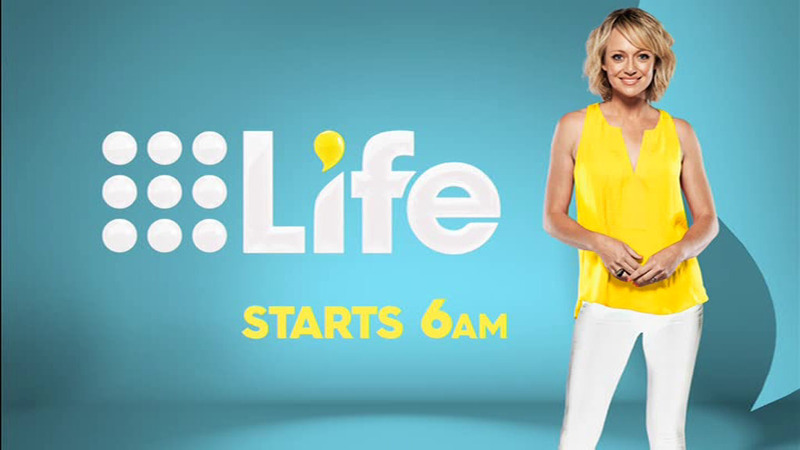 As per the announcements, at 6am on 26th November 2015, the 9Life channel was officially launched and the Channel 9 Freeview offerings have undergone a reshuffle as a result. Anticipating this move for a week now, I had my trained eye watching to see just what happened and where the chips had “fallen”. 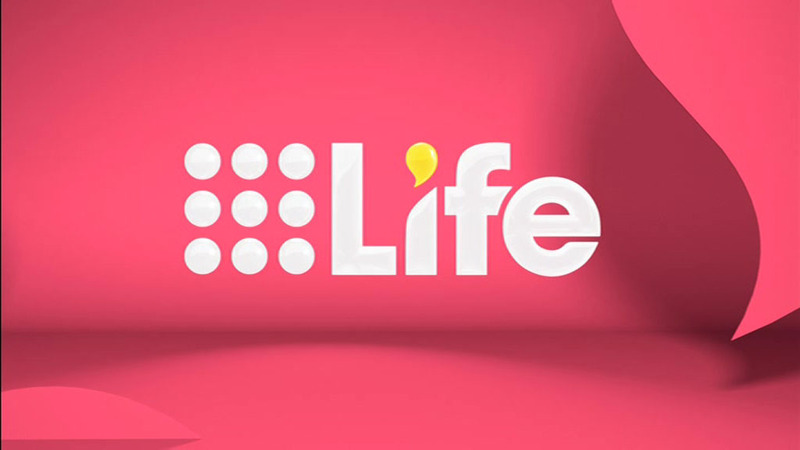 Weeks in advance of the changes, Channel 9 had run ad campaigns on their channels reminding people of the impending launch of 9Life. Watching the multiplex, at around midnight on 26th November, EXTRA2 ceased regular broadcasts and replaced the video feed with a solid colour screen featuring Shelley Craft alternating with one of the 9Life logo. Other channels continued their regular programming, and the time of launch was given as 6am. Watching the transport stream like a hawk, the first sign of program changes occurred when new PMT/PATs were sent out and programs started their reshuffle at 3:03:20am (or thereabouts) according to the TDT, with the first binary mention of “9Life” occurring at 3:04:35am, and the changes finalized roughly 10 minutes later. A promo aired at 5:57am, and programming did not appear until the claimed 6am time slot beginning with The Block. Some information had been published online about the expected channel changes, and even in the comment on my previous analysis post gave us some idea of what was supposed to happen. What actually happened, on a technical basis, seems to be rather interesting. As is seen from the table, all the channels have received new names although the LCN numbers in use. One less virtual service exists. A 9HD Sydney is now simulcasting the main standard definition Channel 9 Sydney, however, is using the much more efficient H.264 AVC compression in full 1080i. At last, a full high definition channel is now on the air again, however, the choice of AVC will rule out decoding on older HDTVs and HD STBs which may not have the necessary hardware to decode them. EXTRA2 has since been killed off, although Extra now takes its place, and 9Life now takes the place of EXTRA. As I had mentioned in the comments, launching new services will cost bits and they have to come from somewhere. As we can see, EXTRA which is now 9Life is now a primary channel, and thus will need a bitrate boost from the “home shopping” bare minimum, and indeed, that was achieved. It also carries a closed captioning stream which was not allocated to the home shopping channels before. 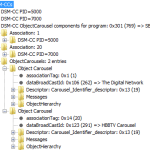 The new standard definition 9Gem is now an independent service, and it needs its own bits too. As a result, 9HD now has a bitrate just under half that of the former GEM service. The choice of H.264 compression was inevitable if quality was to be maintained. The service now has 0.07238 bits/pixel*frame, which is about equivalent to 0.15 bits/pixel*frame of MPEG2 accounting for the compression efficiency difference. As a result, we can expect the new 9HD to have a clarity comparable to SBS HD (i.e. the lowest of the HD services on offer) and only marginal benefit over SD broadcasting. The requirement to broadcast the main channel in SD likely continues to protect analog TV and STB owners from losing access to the main channel. If you’re interested in the “nuts and bolts”, the individual PID rates were measured and found to be pretty similar to that before. No modulation mode changes were made, and no extra bitrate was gained for the multiplex (difference in totals is due to timing discrepancies). It seems that the channel reshuffle has occurred and the launch of 9Life went off without much of a hitch, but now, the HD service is H.264 encoded out of necessity due to the bitrate budget. The actual video bitrate of 3752kbit/s is indeed so low it is roughly equal to Youtube’s 1080p offering which I know to be smeary and lacking in detail. However, it is nice to see that we are finally breaking loose from the MPEG-2 shackles, and now we do have a full 1080i service, even if it is a bit murky. 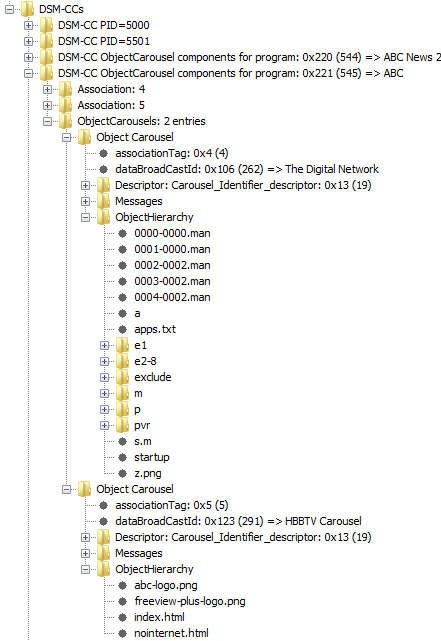 While I was at it, I’ve decided to explore other MPEG-TS analysis tools to try and get better understanding of different data structures within the TS. As a result, since the last analysis, I have come up with some more information which didn’t really deserve its own article, so instead, it will “ride along” with this one instead. 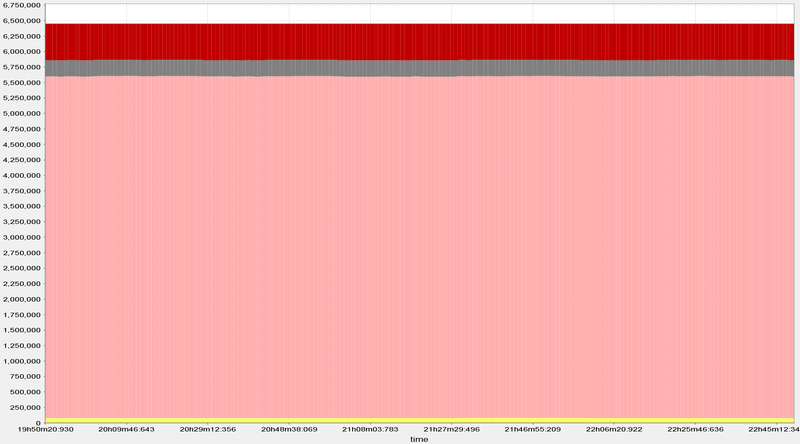 Here, we can see a bitrate allocation chart drawn using DVB Inspector for each of the recorded TSes. 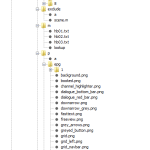 As DVB Inspector isn’t particularly happy with long files due to memory overflow, some files were cut. It is clear from the charts that Channel 7 and TVS do not use statistical multiplexing, and instead, rely on fixed bitrate allocations and constant bitrate encoding. Again, from the charts, it’s clear that the rest of the networks do enjoy the benefit of statistical multiplexing which can “trade” the bitrate budget amongst channels depending on their requirements. Some of the channels look pretty “fixed” as they are the home shopping channels which have been wound down to bare minimum anyway, and aren’t really “eligible” to trade bits (thus may have been set to constant bit-rate mode or constantly hitting its minimum bitrate limit). 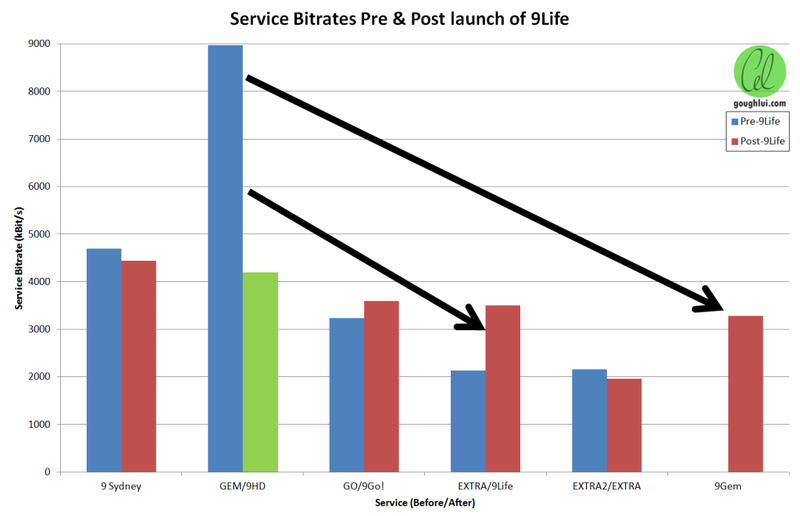 The allocation post-9Life launch can be seen to show that the HD service only marginally consumes more bandwidth than an MPEG-2 SD service. I never really understood the megaframe SFN synchronization packets, beyond the fact they help carry timing data from the transmitter to help synchronize SFN repeaters by providing the sub-second resolution data over that carried by the TDT. Even with the help of DVB-Inspector, I don’t quite understand it, but it seems one interesting finding is that Channel 7 uses Periodic mode, whereas all other stations use Aperiodic mode. TVS, not having any SFN repeaters, does not broadcast synchronization packets. 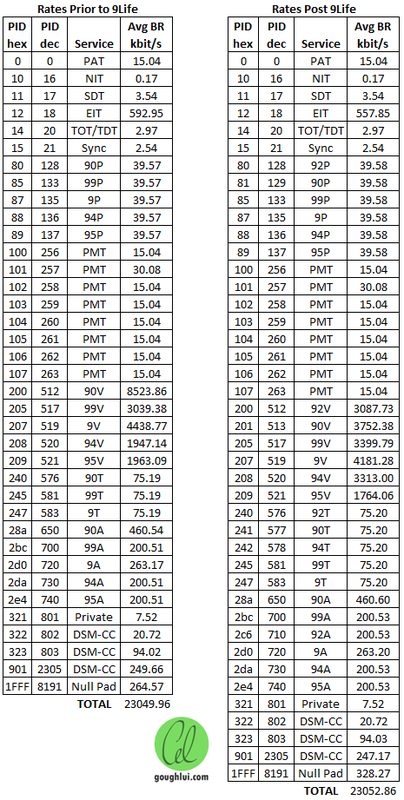 One thing DVB Inspector really helped me with was understanding what the DSM-CC PIDs were used for. 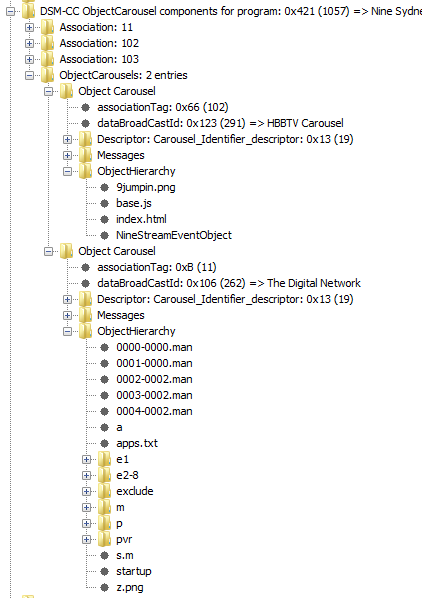 As I had suspected, it is definitely used for datacasting and sends object files to end receivers for HBBTV (hence also related to the private stream) and about the network itself. 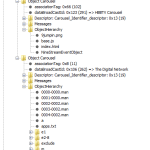 A partially expanded tree for ONE (Channel 10) shows the regular sort of DSM-CC data being sent. 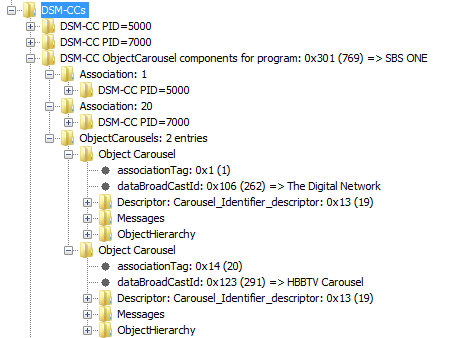 The first Carousel is for hybrid broadcast broadband TV usage, and has some HTML files for “Freeview Plus” usage, just like the private stream has some data about where to grab the xml configuration for HBBTV. 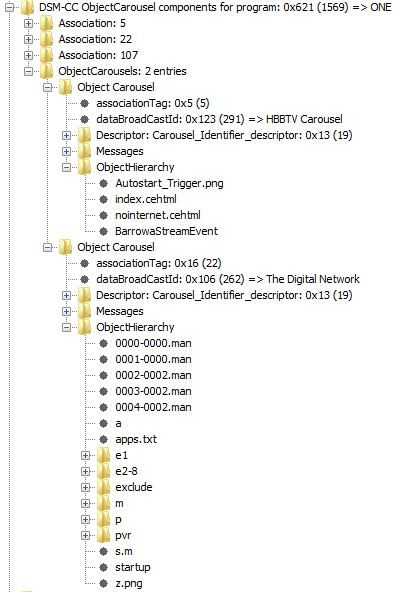 There is also a serviceinfo.txt file somewhere which I extracted from Channel 9 and it explains all those crid:// URIs in the NITs – it helps the TV identify the program and transmitter more accurately. 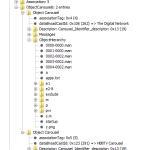 The file itself has a list of programs, CRIDs, but its format is a little mangled with some characters lost and random line breaks inserted. Other stations hierarchy diagrams are shown below, but most show exactly the same sort of thing, so it wasn’t worth showing in full scale. Again, it’s pretty fascinating to see that the transport streams on the air are carrying more information than I had anticipated. This entry was posted in Computing, Telecommunications and tagged analysis, digital tv, dvb, freeview, number crunching, rf, tv. Bookmark the permalink. 2 Responses to Analysis: Freeview Sydney – Launch of 9Life, DSM-CC, etc. Very likely due to the encoding. H.264 has a deblocking algorithm built into it, and will start to show softness before it shows any hard blocking as MPEG-2 would. 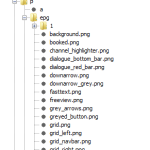 That being said, I’m sure if you looked closely in certain highly detailed areas, say hair, fabric patterns, etc, you will find they appear soft and lacking in detail instead of being blocky/ringy and noisy as MPEG-2 broadcasts typically would be. I definitely agree on the content point there ;). At least we are moving on from the past … at long last.